Many people are very superstitious. They follow their little rituals, just to make sure that luck is going to be with them. You do not need to be that kind of person to play games of chance. This is very important for the people who enjoy playing blackjack. However, it is good thing to tip the dealer. Many people do not do it because they do not want to lose more money in the casino. But keep in mind that the dealer is the person who you play against. He might help you from time to time and because of that you could actually start winning. Consider this money to be invested in a brighter future. 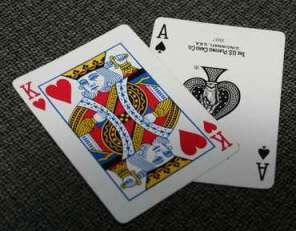 You do not need to be superstitious, especially when it comes down to games like: blackjack, poker, slot machines etc. Only luck and math is involved in these games and if you are winning or losing it has nothing to do with the fact that you have not performed your little rituals before entering the casino. Still, many people do bring their lucky objects; perform little rituals before they turn the card and etc. This is ridiculous. There are many superstitions in blackjack. However, all people must understand that their believes are not going the change the next card. It is there and no one could change it with another card. It all depends on your luck. The biggest superstition in the world of blackjack is that you are not supposed to shout for the card you need. You must not tell "Please, 6 come to me". The same thing is applied when you want the dealer to lose. You are not supposed to ask "Please, dealer go over 21" because it will never happen.